Welcome to Barbecue'n On The Internet's "Beginner Pages!" This section will offer the beginning outdoor cook basic, solid and time tested tips, techniques and as-well-as advice to get each person on the road to mastering the . . . . .
As with most new beginnings, getting started outdoor cooking may seem somewhat daunting. However, with a little guidance and hand holding, will become the greatest source of pleasure and enjoyment of the outdoors and cooking. Since we recommend mastering the art of Grilling first, we will provide the knowledge and encouragement to move each person to the possibilities of grilling chicken, fish, burgers, hot dogs and even steaks! Once mastering the fine art of "Grilling", you will soon wish to advance to beginning "Barbecuing". True "Smoking" is left to the advanced cooks and professionals. 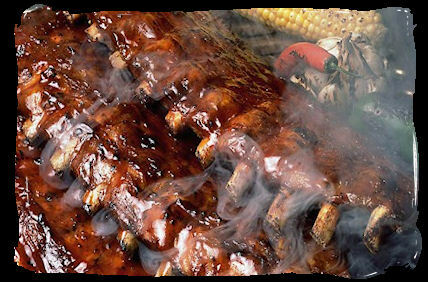 When someone says that they are going to smoke this or that, more than likely, they are talking about barbecuing! Be sure to get them to clarify that! So, let's get on with the getting on . . . . . . We welcome you to the introductory course on Grilling and Barbecuing. Study well and become famous or notorious! Our first section will discuss the various aspects of "Wood Grills", "Gas Grills" and "Barbecue Pits". . . . . .